What can make macarons better than they already are? Triple strawberry macarons! 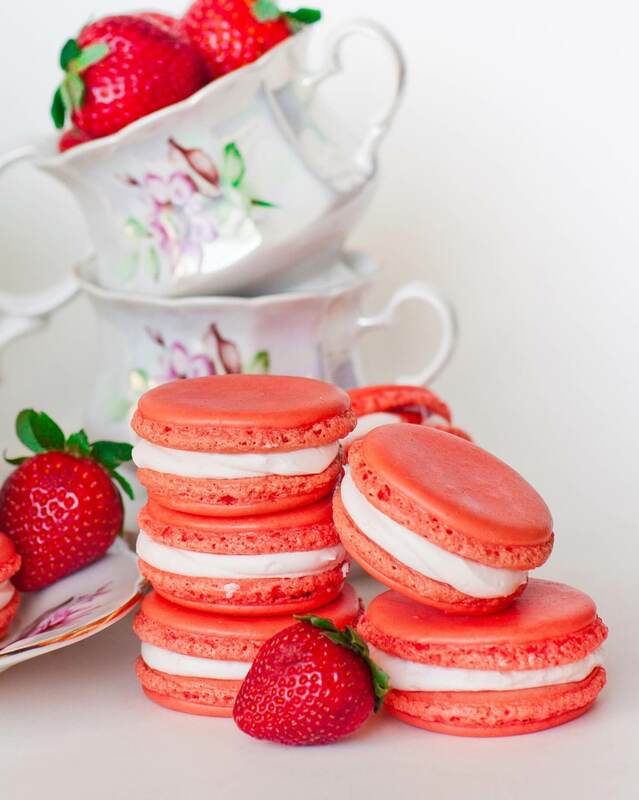 I love macarons and strawberries so I combined the two together to create this epic recipe. These sweet little cookies are made with a strawberry almond biscuit, strawberry buttercream and a sweet strawberry surprise center! Whisk the egg whites just until they reach stiff peak stage. Under mixing will result in a flat batter; over mixing can cause the cookies to spread while baking. Fold the batter thoroughly, flattening the egg whites against the side of your mixing bowl. BUT, be careful – you don’t want to over mix the batter! That will also cause your cookies to be just flat, shapeless disks. Allow those cookies to REST! Let the cookies stand for an hour at room temperature, allowing a thin shell to form on the outside. This shell gives the cookies their shape so it’s crucial! If your macarons are cracking on top, you might need to let the cookies rest longer. If you live in a humid climate, extend the timing even more as humidity and moisture will prevent a shell from forming. Watch my video tutorial for step-by-step instructions to get perfect macarons! I use this Lorann Oils strawberry emulsion for this recipe. Preheat oven to 325F. Prepare 3 baking sheets lined with parchment paper. If desired, draw circle guides on the back of the parchment paper for guides; set aside. Prepare the dry ingredients. Measure out the almond flour and confectioner's sugar. When measuring in cups, do not pack the ingredients into the measuring cup, spoon in the ingredients! Place the flour and sugar into a food processor and pulse for a few minutes until the two are well combined. Sift the mixture through a fine-mesh strainer into a large bowl. If any almond pieces remain, return them to the food processor and pulse again, then sift again. Prepare the meringue. Place the egg whites into a very clean mixing bowl. Add the sugar. Mix on high speed until stiff, glossy peaks form. The egg whites should stick to your whisk attachment when lifted from the bowl. Mix the cookie batter. Add the strawberry emulsion and gel color to your mixing bowl. Add the sifted dry ingredients. Using a large spatula, begin folding the meringue and flour together. Scrape from the bottom of the bowl and press the ingredients against the sides of the mixing bowl to deflate the meringue. Continue folding and mixing until batter reaches the consistency of thick lava; the batter should ribbon off the spatula and settle back down into the bowl. Transfer the batter into a pastry bag. Pipe small dollops onto the parchment paper, spacing the cookies about 1 inch apart. To rid the batter of air bubbles, tap the pan hard against counter top lined with towel. Let cookies stand at room temperature for 30 to 60 minutes, allowing the cookies to form a thin outer "shell". The time will depend on your local humidity (you can check your local weather channel for humidity levels; these cookies work best on low humidity days!). Bake cookies in preheated oven for 12-14 minutes. Each oven bakes differently, watch the first pan carefully. If cookies are browning, your oven is too hot, turn it down by 5 to 10 degrees. Remove cookies from oven and cool on parchment paper, then transfer to wire rack. Cookies should lift off of the parchment paper with no resistance. If they are stuck, this means your cookies are still raw and didn't finish baking. Turn half of the cookies over and pipe a generous amount of filling onto each cookie, leaving the center empty. Into the center, pipe a small dollop of strawberry preserves. Sandwich the cookies with an empty half. Store the cookies in an airtight and sealed container in the refrigerator. Take them out about 1 hour prior to serving to allow the buttercream to thaw. This recipes makes about 20 medium-sized macarons. These look delicious! Love the preserves in the center! Waiting for the cookies to mature a few days is the hardest part for me! Made these today. They are soooooo good. Can’t wait to try it in a few days. Had a good amount of strawberry buttercream left over… Any suggestions on what else I can make with it from your recipes? Where do you buy the strawberry emulsion? Is there any stores that carry them or is it an online order? Can I use just regular flour on this? Thank you. Sorry, regular flour will not work for this recipe! Is the butter unsalted butter or just normal butter? These will be my first macarons ever. Could you please tell how much each butter stick weighs (we don’t have such sticks in our country) ? It is difficult to measure butter in cups, unless it is melted. Thank you! Hi! Sorry about that! I just updated the recipe to include metric measurements for the filling, too. Hi, would strawberry extract work as well? Thanks! I look forward to trying this. trying this recipe out, since my recipe from “the gramercy” in nyc isn’t working well in a home kitchen. i’m stoked to try it out, these look great and will let you know how they turn out!